The Central Electricity Authority (CEA) of India, with allegedly a view to fill the gap between supply and demand in power is pushing towards the exploitation of maximum hydroelectric potential in the country. As a part of this plan, launched in May 2013 and named "50000 MW hydro power initiative", 162 schemes with probable installed capacity of 50,600 MW and located in various river basins spread over 16 states have to be taken up for preparation of Pre Feasibility Reports (PFRs) in the first phase. The proposed Bajoli Holi Hydroelectric Project is one such scheme identified in Ravi Basin in Chamba district of Himachal Pradesh State. Bajoli Holi Hydroelectric Project is a run of the river scheme that envisages the construction of a 30 m high diversion barrage across the river Ravi, 200 m downstream of its confluence with Channi nallah (rivulet). The project has been awarded in 2007 by the government of Himachal Pradesh to the Bangalore-based company GMR Energy Limited. According to its technical profile, the plant has the capacity of 180MW to feed into the Norhtern grid and represents an upstream development of Kutehr Hydro-electric Project (260 MW), built on the same river. The project is said to be completed in 2018. In 2008, unlike it was previously announced and discussed with the villagers of the area, GMR shifted the site of the tunnel and the powerhouse from the barren and uninhabited right bank of the river to the left bank, which comprises four gram panchayats, dense forests and rich agricultural land. This was done due to the "greater techno-economic feasibility", according to the company, but represented the major cause of stiff protests by the local inhabitants as no proper EIA study or report was prepared in that regard. Locals allege that the shift of the project components was approved by MoEF without clear evaluation, while the forest clearance has been granted in clear violation of the Forest Rights Act. A local woman stated that "“We gave the no-objection certificates to the company believing that the project will come up on the right bank which has no habitation, no orchards and no fields. Nobody knows how the site was changed from left to right bank. We also want development of the area but not at this cost,”. The protesters also noted that: -No permission from the National Board for Wildlife has been obtained and that the dam site of the project is within 10 Kms radius of Dhauladhar Wildlife Sanctuary. -No cumulative impact assessment (CEIA) has been done by the state government, despite indications by the Forest Advisory Committee (FAC). The reason that GMR preferrs the project to be on the left bank rather than on the right is the comparative ease which comes with switching sides. Since the left bank is already populated, it already has basic infrastructure like access roads. As villagers protested such a change in location, Chamba’s Deputy Commissioner sought HPSEBL’s opinion, which disapproved the justifications given by GMR for shifting of the project . The board noted that the left bank had subsurface water sources, lakes and ponds which may dry up due to construction activity; it was also found to be geologically more disturbed due to heavy landslides. However, MoEF and Special Secretary (Power) of the HP government approved the shifting. Two public hearings have taken place; the first on April 19, 2010, by GMR witnessed strong opposition from all the five affected gram sabhas. The second was held on October 30, 2010, where most of those present approved the project with conditions that the company takes adequate care regarding the possible damages, adequate compensation and ensures guaranteed employment to the locals in the project. The Expert Appraisal Committee (EAC) of the Union Ministry of Environment and Forests also accepted the company’s case for the project on left bank. Though all five gram panchayats gave their consent to the project, two of them (Holi and Nayagraon) later withdrew their support citing the diversion of large forest land and possible loss to livelihood. In Feb 2012, a local inhabitant approached the High Court. It became quite clear that the proposal of the company is guided by commercial advantages of the left bank option, namely, short lead time to commencement of construction as well as savings in infrastructure. During the hearing, the court refused to consider this opinion noting that the Central Electricity Authority is the only competent authority and it has already given its approval for shifting the project. The plaintiff appealed then to the National Green Tribunal in the Delhi branch but the case was dismissed on April 24, 2014; judges declared "We hardly find any merit in the various contentions raised by the appellant except to the limited observations afore recorded. Thus, the present appeal is dismissed, however, with the direction to the project proponent to seek clearance from the National Board for Wildlife in accordance with law." 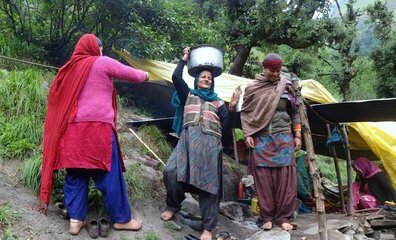 However, local inhabitants still manifest their discontent; in May 2014, during a dharna and occupation of the construction site, 31 local Gaddi women have been recently even accused by HP police of “inciting communal riots”. When asked to leave and stop the occupation, one of the woman said "“After the incident, sub divisional magistrate, Jitender Kanwar, visited the site along with a company official. He asked us to stop the protests and let the construction work happen peacefully. But we told him that he should grant us 15 days to start our own case against the project proponent,”. She also added "“We are fighting because we have seen huge leaks in the tunnel of Chamera III project downstream leading to an entire village getting evacuated overnight. We do not want the same fate to befall us. Our struggle in exercise of the powers and responsibility to protect our natural resources under Section 5 of the Forest Rights Act shall continue till the company stops construction of the project on the left bank”. In fact, the leakage from the tunnel in the nearby project Chamera III has caused extensive landslides in the area damaging houses, shops and farms thus pushing the residents out. According to Manu Moudgil, who authored an article in the India Waterportal, one of the main issues in the local struggle are forest rights; in a context where the state government tries to dilute the restrictions to forest divertions in favour of hydelpower, forest dwellers defend their territories and livelihoods. The project has also been registered for CDM funds in 2011 as it would "aid in bridging the gap in demand and supply and also increasing the share of renewable energy in the grid mix. The electricity exported by the project would displace an equivalent amount of electricity generated by the power plants already operational and proposed to be added in the NEWNE Grid which relies predominantly on fossil fuels". According to the PDD, the additionality criteria is being met because "The Internal Rate of Return for the project activity works out to 9.03%. Hence it can be clearly observed that the returns from the project do not exceed the benchmark of 14.25%. Thus the project activity on its own is clearly not a financially viable option and hence the revenue from CDM is essential to make the project activity a financially viable venture." Project Details The 180 MW Run of the River’ project is located on the River Ravi in the Chamba District of the state. The project envisages the construction of a 66 m high concrete gravity dam near Bajoli village, approximately 950 m downstream of the confluence of Channi nallah and the river Ravi. This proposal would generate 762.98 Gwh in 90% dependable year. The project has been awarded to GMR Energy on ‘Build-Own-Operate-Transfer’ (BOOT) basis for a period of forty years from the commencement of commercial operations. In this duration, the project company is obligated to provide 12% free power during first 12 years, then 18% for next 18 years and 30% thereafter to the state of Himachal Pradesh as royalty payment. Occupation of construction site by Gaddi women belonging to the local mahila mandals; they had erected a temporary camp to keep the vigil near the construction site. They then started a dharna. Development of Alternatives Local inhabitants would be open to accept the project only if implemented on the right bank, as previously agreed. They also want fair compensation to be given and measures taken to avoid leakages as occured in Chamera HEP.